Our cosy vintage 5 ★ truck has been put to pasture and creatively and skill fully transformed into a unique and bespoke farm accommodation. In Ireland we call it ‘Glamping’ which is short for ‘Glamorous Camping’. You get all the benefits of camping without any of the hardships. The Glamping Truck is comfortable and spacious – fully insulated with a wood burning stove, an electric shower and a flush toilet. Two comfortable double beds snugly fit over the truck cabin and a handmade settle bed doubles up as a twin bed, while used as a couch during the day. We enjoy cooking and using our own top quality, grass fed free range pork meats and eggs. We have a BBQ grill if you would like to taste some of our succulent produce for lunch or dinner and if you want to give yourself a great kick start, fuel your day with a full Irish breakfast from our farm. We are situated in The Burren and Cliffs of Moher Geopark, outside the village of Kilfenora and enjoy scenic and peaceful countryside. 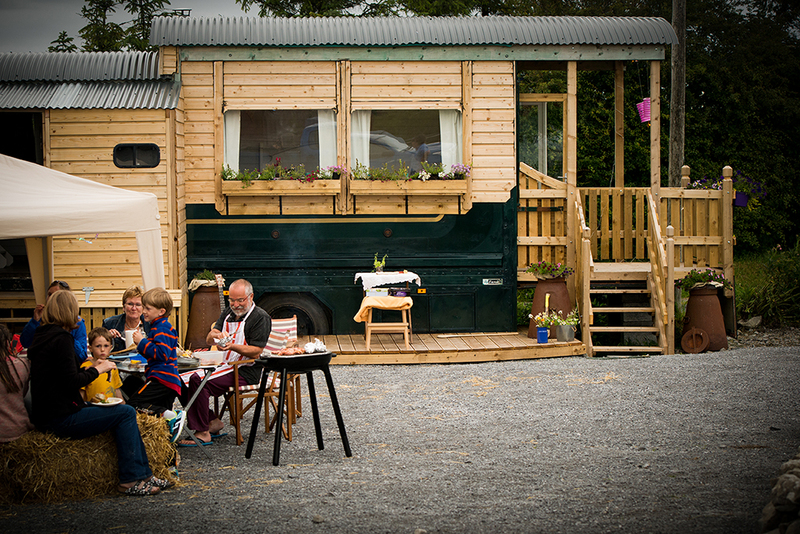 The Glamping Truck sits right at the heart of the farm, a stone throw from the well preserved Iron Age, Tullagh Ringfort. The lack of light pollution allows you to star gaze and the darkness at night allows for a good nights sleep. 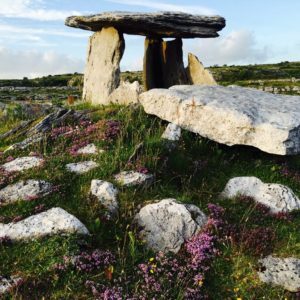 The Burren, sometimes referred to as the fertile rock, is a part of the Wild Atlantic Way on the west coast of Ireland. It has a unique flora where Alpine, Arctic and Mediterranean plants grow side by side and the largest and most accessible karst regions in the world, with stunning geological formations and archaeological remains. Among the many animals over the farm gate of our small holding, you will meet Bianca and Simone – our British Saddleback pigs that are free range, sociable and curious. Last spring, 28 little piglets were running and playing around in the paddocks. Further a field our small beef herd graze all year round and the hens roam and provide your breakfast eggs. Ronny and Jules, the donkeys, watch curiously all the comings and goings on the farm. Check out the Burren Free Range Pork Website. Situated on the edge of the Burren, amongst rich grasslands, we run a traditional, sustainable and eco friendly farm, using no fertilizers or pesticides where animal welfare is core. We make sure not to overstock our fields to ensure good grass and herbs for all animals. We also have a large poly tunnel and a small vegetable garden and soft fruits that provide fresh food for ourselves, our guests and the animals. In essence, it’s a good place to come to rejuvenate, relax, recharge batteries, socialize with family and friends and to get some fresh country air!